Clean design of cylinder vases with large floating candles with little pots of purple and off white tulips and tealights. 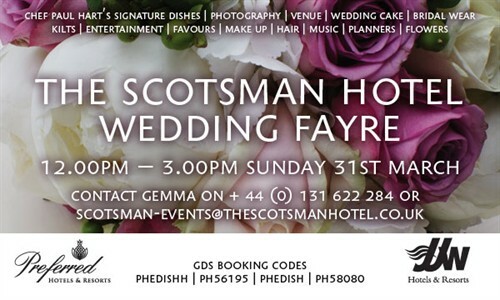 Venue: The Scotsman Hotel, Edinburgh. The wedding ceremony was held in the Russell Suite and the dinner reception in The Club Room. Claire held a hand tie of hot pink ranunculus, red ranunculus, mango cala lilies and with orange and red tulips. Claire’s bridesmaid held a hand tie of all hot pink tulips. Low, loose arrangements with hot pink ranunculus, red ranunculus, mango cala lilies and orange & red tulips to match the bridal flowers. The top table arrangement was a long and low arrangement using the same flowers to match. Chloe held a hand tie with a slight trail of soft white and green seasonal flowers with white anemones. Long table setup with 3 tall silver candlestands, long taper candles and a garland of greenery and flowers on each. Another garland with seasonal flowers in shades of white, blue and purple ran full length down the middle of the table. Emma held a hand tie of white hydrangea, white ranunculus, white roses and blue muscari. Cylinder vases with floating candles with pots of blue grape hyacinths, white roses and ranunculus and with frosted tealights all sitting on a large round mirror plate. 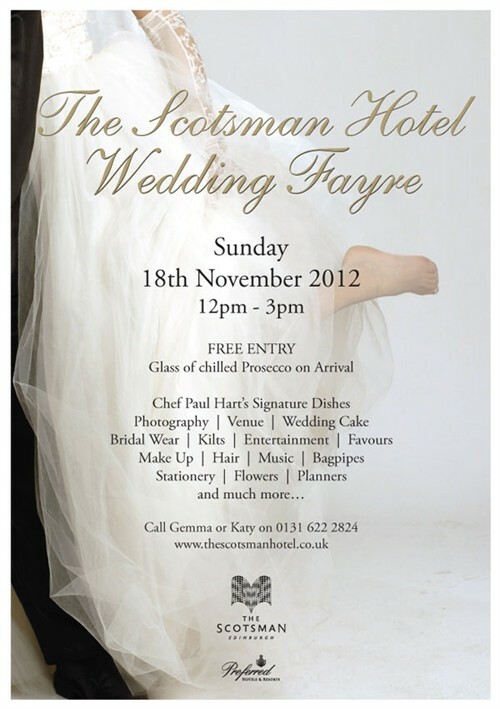 The Scotsman Hotel are holding a wedding fayre this weekend. Come and visit the venue and meet with many leading wedding suppliers, including ourselves, where we will be onhand to discuss any aspect of your wedding. Come and view one of the most idyllic venues the city has to offer; meet a cacophony of exhibitors, receive free samples and get a host of expert advice. 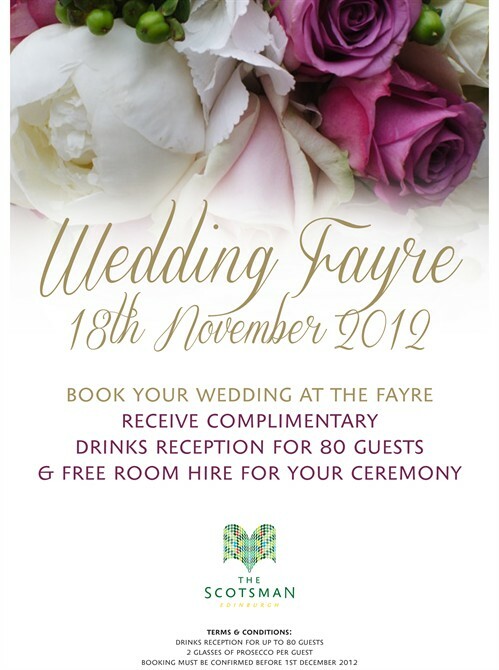 The hotel will also be giving away two romantic dinners for two at our North Bridge Brasserie… and in addition are also offering a complimentary drinks reception for 80 guests & Free room hire for your ceremony – if you make a booking at the Wedding Fayre. Tall martini style vases topped with a full, lush arrangement of cream avalanche roses, blue thistle and greenery. Tealights surrounding the base finished off the look. Top Table – Long & low of cream avalanche roses, blue thistle and greenery. Emma held a loose, country garden style hand tie with seasonal flowers in off whites and greens. Emma’s bridesmaid held a similar but small hand tie. Tall silver candlestands with long taper candles and a thick garland of natural white and green seasonal flowers ( norma jean roses, gladioli, eustoma, thistle, heather and hydrangea) down the stem. Cylinder vases with water & floating candles and some tealights were placed around the base of the candlestand.